When WW1 conscription was introduced in 1916, Farnhill Parish Council created a Roll of Honour – naming 68 men from the village who had volunteered or who were already serving with the armed forces. This Roll came to the attention of Farnhill & Kildwick Local History Group in 2014, when the Parish Council loaned the minute book to the group and allowed it to be scanned. Later that year a copy of the Roll was used as part of the History Group’s exhibit at a Local History Fair held in Skipton Library. There it attracted the interest of staff from the Heritage Lottery Fund (HLF), who suggested that it could form the basis of a project that might obtain Heritage Lottery Funding. Together with Kildwick and Farnhill Local Village Institute, the History Group formed the Farnhill WW1 Volunteers Project, which put forward a successful bid for Heritage Lottery Funding to research the lives of these men before, during, and after the war; and to explore what village life was like 100 years ago, and the social context in which the men lived. This website shows the results of this research, carried out during 2017 and 2018, as well as work done subsequently by members of the History Group. A full report on all the activities carried out by the project during its two-year lottery funding was prepared for the HLF in January 2019. 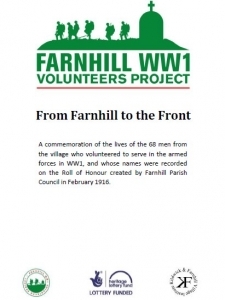 If you have any additional information – photographs, documents or other material – about the Farnhill WW1 Volunteers or their families, please get in touch with the project through our Contact Page.